Yesterday I installed Ubuntu 16.10 (Unity) alongside Windows 10 which was already installed. How can I close it without that message popping up? I want it to pop up only if the terminal is executing some command. Something is running. su is running. You can verify if you have a clean terminal with everything closed by typing exit at the prompt. If you exit out of su, then you can close it without getting the process running on this terminal, prompt. If a process is running, just keep executing exit until all the processes are closed. Not the answer you're looking for? Browse other questions tagged command-line unity sudo gnome-terminal process or ask your own question. 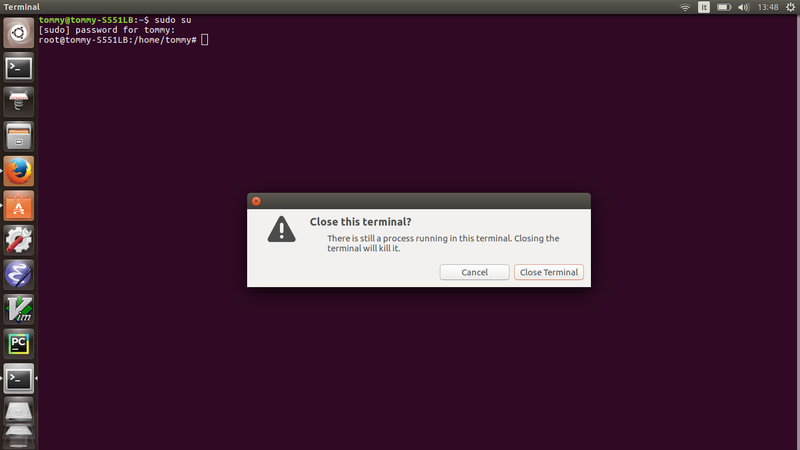 How to disable popup “Close this terminal?” when closing terminal? How do I get rid of the password promting in the Terminal? How can I make Sublime Text 3 run as root from Unity?